Tata Tiago is one of the best options in the entry-level segment in India. Based on the new Impact design technology of the company, the hatch is offered with the best-in-class driver-focussed cabin. Despite being small, Tiago is a great option as it has all the right features, which are missing in many of its competitive cars. Tiago comes with powerful diesel and petrol engines, and both the options have a very effective air conditioning system. The centrally-placed AC vents allow quick cooling of the cabin in no time even in hot and humid weather conditions. The variants of Tata Tiago that offer air conditioner as standard include JTP, Revotorq XE, Revotorq XE(O), Revotorq XM, Revotorq XM(O), Revotorq XT, Revotorq XT(O), Revotorq XZ, Revotorq XZ Plus, Revotorq XZ Plus Dual Tone, Revotorq XZ w/o Alloy, Revotron XE, Revotron XE(O), Revotron XM, Revotron XM(O), Revotron XT, Revotron XT(O), Revotron XTA, Revotron XZ, Revotron XZ AMT, Revotron XZ Plus, Revotron XZ Plus Dual Tone, Revotron XZ w/o Alloy, Wizz Edition Diesel, Wizz Edition Petrol. 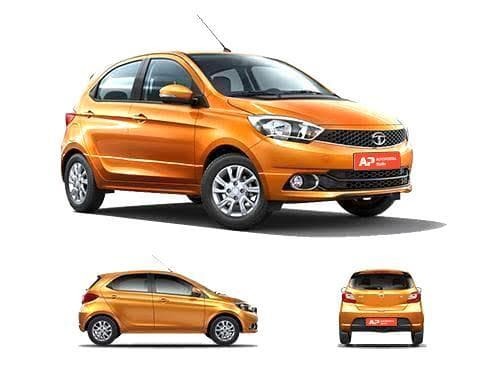 The variants of Tata Tiago that do not offer air conditioner as standard include Revotorq XB, Revotron XB.